Tetris is the first video game I was unable to shut off on command. Players of Sid Meier’s Civilization are familiar with the problem of “one more turn”, similar to the bookworm’s “one more page”. Tetris was my first “one more turn” game. 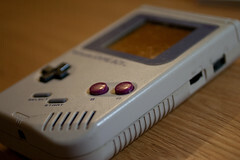 I first played Tetris when I was five or six and received my Gameboy for my birthday or Christmas. At first Tetris seems as though it should be the most boring game on Earth, especially to people of my age group. We hadn’t played Pong or any of the Atari games. We didn’t start playing games until after the video game crash of 1983. To us, video games were synonymous with Nintendo. And I didn’t get the first iteration of Nintendo Entertainment System with that robot either. (Wow. We’ve come quite a long way. The first Nintendo was called the Entertainment System! And in Japan it was called the Family Computer or Famicom. Now it’s just the Wii) For me, video games were Duck Hunt and Mario. And, a year later Double Dragon and Bubble Bobble. With the exception of Duck Hunt, these were dynamic games. As Mario moved from left to right, he encountered new enemies and a changing landscape. First this little roach thing (I didn’t find out goombas were mushrooms until much later). Then turtles were added and I had to watch our for the ricochet of the shell. Then, the next thing I knew, I touched a flower which made me shoot fireballs. And, I didn’t question it. That’s one of the magical things about being introduced to video games as a child – a lack of cynicism. You don’t sit there wondering why touching a flower suddenly gives you the ability to shoot fireballs from your … pockets? It always looked to me like he was taking them out of his pockets. The instruction manual had told us to expect this. There was no joking about mushrooms and Mario being high. We didn’t wonder how Mario wasn’t burning his hands with the fireballs. In fact, until my grandfather came over, I had never really thought about the reality of the game. Forever the joker, he asked me, “How doesn’t he get a headache, hitting his head on those blocks?” And I didn’t have an answer. And from then on, my brother and I would say “ouch” when he hit his head on the blocks. (Although I later found out he was hitting it with his hand, you just had to look very, very close and you could see the pixels above his hat) When I hit the invincibility star, I laughed with glee as I could run into every creature and ended up running off a cliff. With Double Dragon, the foot soldiers were pretty generic at first, but there were weapons to pick up like chains and bats. And there were different techniques for different bad guys. And Bubble Bobble had a succession of colourful levels – each with a different technique needed to beat it. And it kept tacking on different baddies until we had seen them all and then they were combined in various ways. Tetris was the exact opposite of any of these games. There was one screen. It looked like a well and it filled with seven different pieces. You lose if the pieces reach the top. I’m convinced if Tetris were developed today, you would start off in level one with only square pieces, just to make sure you understand what to do. And a popup would appear telling you to make a line across the screen. And if you put a square on top of another, it would remind you that you needed to make a line across the bottom. And you’d have to unlock the pieces before you could use them – to make sure you knew how to use it! And multiplayer wouldn’t be playable until you beat the game on one player first. (I’m looking at you Warioware!) So it’s a wonderful thing that Tetris was developed in the early days before all this handholding. The tetrominoes would fall for an infinite length of time in game type A. (Not really, but it certainly seemed this way) Every ten lines the pieces would fall a little faster. And the bits come randomly, but I’m convinced the game was programmed to provide way too many squares and far fewer straight lines. The gameplay is so easy to understand. And there are the score bonuses for clearing more than one line at once, but I never saw a point unless I was playing with someone else. In a big way, it was this extreme simplicity – the fact that there was only one “level” that made Tetris the game I always went back to. I like puzzle games in general, but I don’t play most of them as often as I play Tetris. And I think it’s because when you have a game with many different levels or boards, it allows one to be a favorite. And when you have a favorite level, you want to play that level over and over. But then you get bored of that level. And for some reason this boredom only emerges in games where there are different levels. With Tetris there is only one level, so I know I don’t have the choice to pick another and I don’t get bored. It’s somewhat similar to what happens when I tried to pick music to listen to back when I used Windows Media Player. I had to look for songs and make a playlist and I always played the same songs and I would get sick of them. But it was such a hassle to go through all my music to find the songs I like. With Rhythmbox and other music players that ape the iTunes metaphor, all of my music is there. As I listen to songs I rate them. Then I create a smart playlist containing all the songs rated above a certain level. And I listen to that on random and I enjoy that and never seem to get bored of it. I wonder how others see Tetris? Do they see it as a metaphor for construction or destruction? I always imagined I was I was on a crane lowering these pieces towards the bottom in order to build a skyscraper. Whenever a line was cleared, it was just scrolling up a little higher so you could see where the next piece would go. It doesn’t work perfectly as a metaphor, but it’s what I constructed for myself. After all, Tetris doesn’t have any kind of story at all – it is the anti-game in today’s world where everyone has to have a purpose in the game. But in this game you are simply manipulating block and there’s no avatar and no point to it all. I was told by someone else that they saw Tetris as a game where you were blowing up a building every time you got a line across the entire screen. Tetris was, of course, the ultimate two player game at the time. It was one of the few two player games that allowed for direct competition. Most other games either had a two player indifferent mode like Super Mario Bros or a cooperative mode like Double Dragon, Bubble Bobble, or Contra. Now, I never understood the idea behind having a two player mode in Super Mario Bros. I guess the point was to compete on score? Because for the most part I consider multiplayer games to exist because it’s mostly boring to watch someone else play a game (most of the time). But if you have to take turns watching each other play, what’s the point? At least in Super Mario Bros. 3 you get to divide up the work load and launch the Mario Bros. mini-game. 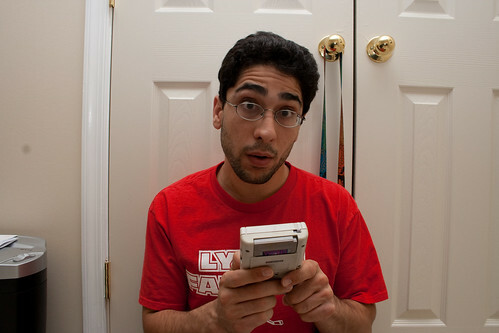 But with Tetris, especially on the Gameboy, you could engage in a challenge. Remember, this was back in the old days before the Internet existed (as far as people outside of universities knew) so you had to play with someone local. This was the main reason we lobbied my mother for a Gameboy for Dan. Then you’d take your cable and hook up the Gameboys and play away. There was something great about being able to give a bunch of lines to the other player when you got a double, triple, or tetris. My brother and I would euphemistically refer to it as “giving a present”. “Ya like your present?” was a common taunt. And “No Indian givers” or some such taunt if the person sent it back to us. I still get a lot of joy out of this when I play modern versions of Tetris. It was just an extra special joy back then. 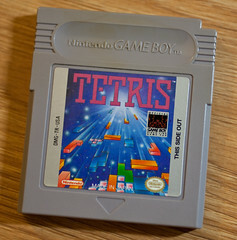 Tetris is also unique in that it works equally well as a single player game and a multiplayer game. Most games work better in some modes than others. Bomberman, for example, feels empty when playing it against the computer. There’s something that just works right about setting up a bomb right in your opponent’s face and then getting to laugh at him right there. When playing with the computer you just feel like you’re playing against a soulless AI that can “cheat” or display a huge lack of intelligence. And Super Mario Bros really only functions as a one player game. But with Tetris it works as both a one player and a two player game. I think part of the biggest reason for this is that when you are playing Tetris in one player mode, you aren’t playing against a computer opponent – you’re playing against yourself. And what feels better than outdoing yourself? And there’s also a joy in beating a friend. As I mentioned above, playing against someone is both an incidental effect of playing well on your own screen and being malicious by, say, lining up two tetrises in a row. Tetris was always my boredom killer. I had about 10 or so games for the Gameboy, more than I would have for any system until I was an adult. But whenever I was at the doctor’s office or in the car on a boring trip, I’d pop in Tetris. It never seemed to get old. Except for five minutes of nostalgia every now and then, I have not played Super Mario Bros since Mario Bros All Stars came out on the Super Nintendo. The same goes for all the games of that era. I installed Bubble Bobble on my Wii and Dan and I beat the whole game in a night and I haven’t touched it since. But Tetris is different. I have tried to acquire Tetris for every system I have owned. We were extremely agitated that it never came out for Gamecube in the USA. There was some weird version that messed with Tetris so much that we returned it to the store within an hour of buying it. And that’s part of the madness of Tetris. Although Tetris is the perfect game and has been since its inception, people have tried to tack on extra functionality every few years. And more often than not, it doesn’t get well received. I thought, for example that the bombs in Tetris 2 were completely unnecessary. (Consider yourself lucky if you’re too young or old to remember that) So I was very happy when Tetris came out on the Wii downloadable games. There were tons of unnecessary Tetris games included and I only played those once and concluded I didn’t give a crap about it. But, I was elated that there was a mode with pure, unadulterated Tetris. Of course, I always turn off all the stupid little add-ons they felt it necessary to add. I want to beat my opponent simply because I was faster at making tetrises and able to keep myself from reaching the top of the screen. I don’t want to win because I made the other player’s pieces suddenly fall extremely fast. Dan and I decided to both review Tetris at the same time without having read each other’s versions first to see how we would both cover the same game. See his version here. If you want to see what a cheesy commercial for Tetris that’s “got bombs in it!”, check out this Tetris 2 commercial from the 1990s. I hadn’t even thought about the multiplayer like you did and I really wish I had. It’s brilliant that harm comes to the other player as an almost unintended consequence of mastering the single player activity. There’s also tension usually present only in fighting and shooting games where two men enter, but only one man leaves. One last thing: don’t think I didn’t notice you knocking ghosting! Ghosting is OK because it doesn’t introduce randomness. You just get to see where your piece is going and so does your opponent. All it does is speed up games. I guess because I’m a horrible writer and don’t necessarily enjoy reading, I noticed something from both your posts. I thought to myself “WTF, I thought this was a review about Tetris. Why are the Beatles mentioned and all these other games. Yes, yes comparison and analogies. I get it. I’m glad you guys did this mini experiment. Both of you are excellent writers and I really love the fact that I can truly see your styles. If you guys did this again and didn’t tell me who wrote what, would I really be able to figure it out? Eric, you tend to vividly describe your memories and really cherish the nostalgia with your bros. You recapture everything very well. Dan, I really liked the haiku and summary in 4 lines. It was very creative. Part of the experiment was for it to be in the vein of tim rogerr’s stream of consciousness style, a style in which he talks often talks about other, seemingly unrelated things to get his point across. Since it was meant to be in that style, we both did it that way. I don’t know what Eric ultimately favors in his writing, but I like how reading tim rogers is more about the journey getting to the point than the point itself. Most people tend to feel that he needs a good editor. At least we kept it relatively succinct. I tend to think we’re relatively distinct, but I’m sure the similarities are unavoidable. You’re right that Eric tended to adopt the personal story aspect much more than I did while I opted to adopt more of the stylistic oddities of tim’s style. I don’t think he’s ever had haiku in his writing, but he definitely writes without worrying about what a typical review should look like. As Dan put it so well, we were specifically imitating someone’s style. On the one hand, I love the freedom to go whereever my mind takes me. If I feel like going off on a tangent will strengthen the post, I’m able to. On the other hand, it’s a bit sloppier and requires less restraint than a post that stays on post. I’m torn about which is a better style. But I think they both work well as long as the audience is willing to go along for the ride. I also thought it was neat how you picked up on what differed in our styles. I think Dan and I are definitely planning on doing something like this again.